Background: Direct-acting Antivirals (DAA) are currently used in the treatment of chronic HCV infection. In patients with renal failure Glecaprevir/Pibrentasvir (genotype 1-6) is recommended for its safety and efficacy. Case Presentation: Although these pharmacological characteristics, an adverse drug reaction (ADR) has been reported during Glecaprevir/Pibrentasvir treatment, such as the development of cholestatic jaundice in an elderly patient with chronic HCV (genotype 2) infection. At examination, patient was jaundiced associated with intense pruritus. Results: Ultrasound and laboratory biochemical tests excluded a liver failure (e.g. 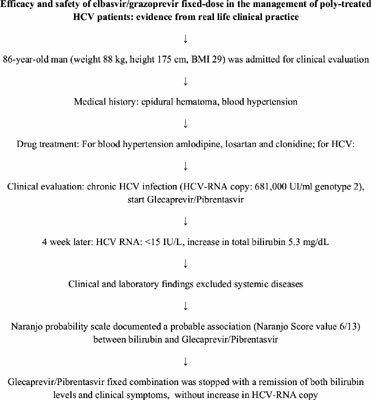 liver cancer, and liver lithiasis) or pancreatic cancer while Naranjo probability scale (score 6) suggested an association between cholestatic jaundice and Glecaprevir/Pibrentasvir administration. About 1 month after drug discontinuation, an improvement has been documented in both jaundice and pruritus, with a normalization in bilirubin levels (total bilirubin: 0.96 mg/dL), HCV-RNA was undetected also. It is worth mentioning that although we reported the development of cholestatic jaundice upon treatment with Glecaprevir/Pibrentasvir we recorded a clinical efficacy (HCV-RNA <15 IU/L) after 4 weeks from the beginning of the treatment, with a complete remission of clinical symptoms until 7 months after drug discontinuation. Conclusion: These data support the clinical efficacy of Glecaprevir/Pibrentasvir association in elderly patients, despite the sub-optimal period of treatment. Direct-acting antiviral, HCV, cholestatic jaundice, GFR, SVR, glecaprevir/pibrentasvir.